Happy New Year – also from Wally Neuzil! On December 31st, 1912 Egon Schiele wrote a postcard to his collector and patron Alfred Spitzer. He selected the card Nr. 745 from "Wiener Werkstätte" - it shoes a litte girl with a "new-year-pig". It seems imaginiable that Schiele himself has designed this card. Hand written documents from historical persons - so called "Autographs" - are of great importance for the historical research. 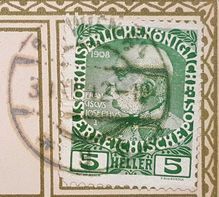 The card in question is part of the collection of the "Egon -Schiele-Archiv" of the Albertina in Vienna and has the inventory number DG2003/2798. The card contains only a few words, so it should be easy to interpret. 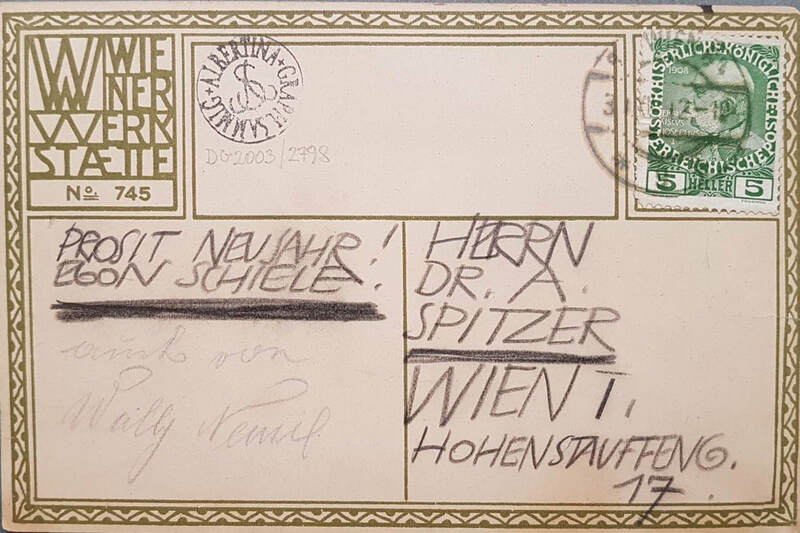 Schiele wrote the address (Herrn Dr. A. Spitzer, Wien I. Hohenstaufeng. 17) and the words „PROSIT NEUJAHR! EGON SCHIELE“ (Happy New Year! Egon Schiele). Below is written „auch von Wally Neuzil“ (also from Wally Neuzi). We also have here an autograph of Wally Neuzil. Very few handwritten sources in her handwriting are available or documented. There are sixteen registration forms ("Meldezettel") in the archives of the city of Vienna - probably three of them were written by Wally´s hand. We know a receipt for Egon Schiele´s landlord Moritz Otto Kuntschik and a letter to the artist Felix Albrecht Harta, dated 1915. It is fascinating that such a compact content still allows a source-critical analysis. The addressee is the Viennese lawyer Dr. Alfred Spitzer (1861-1923). Spitzer was not only a lawyer for Egon Schiele, but also a sponsor and collector. Schiele had already portrayed him in 1911. The fact that eighteen-year-old Wally Neuzil sends her short greetings suggests that she is socially acceptable. 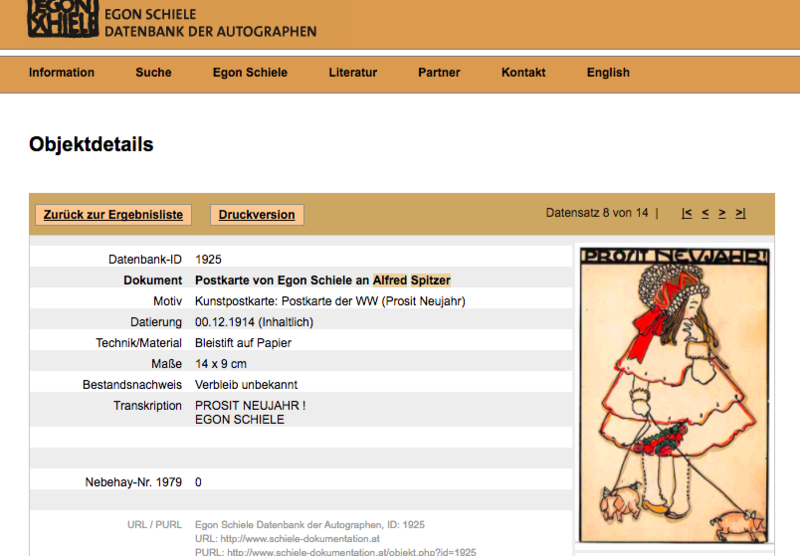 The "Egon Schiele - Database of Autographs" supervised by the Leopold Museum in Vienna has supplemented the presentation of this postcard at the suggestion of the Wally-Neuzil-Society and now reproduces the content and the date correctly. In the book "Die Welt von Klimt, Schiele und Kokoschka" ("The world of Klimt, Schiele and Kokoschka") by the art historian Prof. Tobias G. Natter, published in 2003, the postcard is shown on p. 230. The whereabouts are given as "private ownership New York". Accordingly, it may have been dedicated by the heirs of Alfred Spitzer then to the Albertina. Wally Neuzil - Egon Schiele's model and her traces in Baden. For many years, Robert Holzbauer has been scientifically supervising the lawsuit "United States of America versus Portrait of Wally" pending in New York until 2010. He has also found numerous details on the biography of Walburga Neuzil who was born 1894 in Tattendorf near Baden. In 1917 she went as an auxiliary nurse to the Austrian crownland Dalmatia. On December 25, 1917, she died at the age of 23 in the garrison town Sinj from scarlet fever. Just two years ago, the journalist Lana Bunjevac from Agram / Zagreb found her grave. In the course of his work as a visiting lecturer at the University of Zadar (Croatia), Dr. Holzbauer visited the grave in 2016 and could also find the corresponding entry in the Book of the Dead of the city of Sinj. He now heads the Wally-Neuzil Society / Wally-Neuzil-Society. 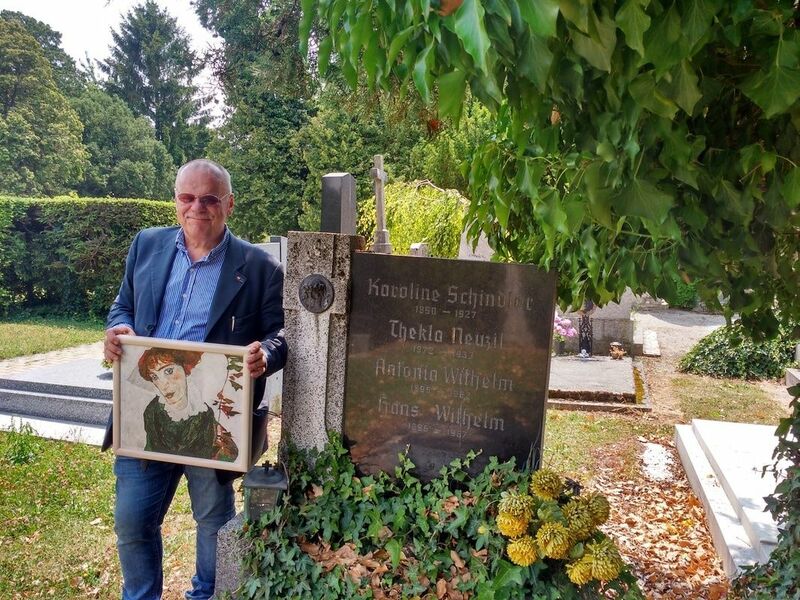 This non-profit association based in Baden has set itself the goal to renovate her (devastated) grave and commemorate the 100th anniversary of death with an exhibition. A new discovery resulted from a note in the newspaper "Badener Zeitung" from 1933: Wally Neuzil's mother Thekla Neuzil, b. Pfneisl (1872-1933) and two of her five daughters, Antonia (1896-1962) and Bertha (1900-1968) are buried in the town cemetery of Baden. Thekla from Tattendorf married in 1895 the elementary school teacher Josef Neuzil from South Bohemia. He was then transferred to Moosbrunn and from there to Wiener Neudorf. In September 1901 he was assigned to the leadership of the elementary school Sparbach. After his surprising death at the Mödling hospital in February 1902, Thekla Neuzil moved with her five daughters to Vienna. Around 1911, Wally met there the four years older artist Egon Schiele and became his girlfriend. Schiele decided in 1915 to marry Edith Harms, which led to the separation from Wally. Egon Schiele's "Portrait of Wally Neuzil" from 1912 is considered one of the most important portraits of the early 20th century and is often referred to as the "Mona Lisa" of Austria. Robert Holzbauer in front of the tomb of Wally´s mother Thekla (1872-1933) and her sister Antonia (1896-1962) in Baden bei Wien. On Friday, June 9th , 2017 and on Saturday June 10th, 2017 the 6th Egon Schiele Research Symposion took place in Vienna´s Albertina and in Neulengbach. 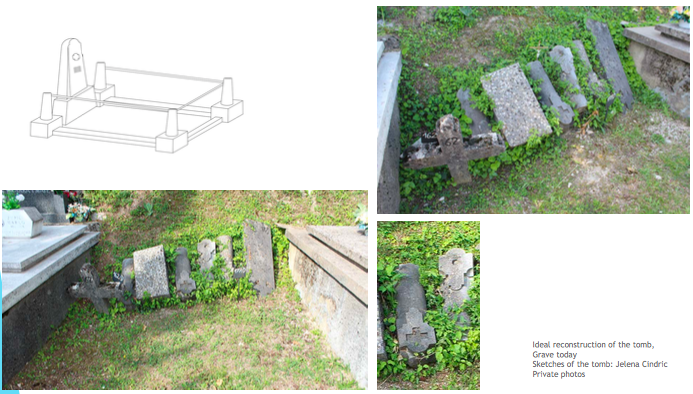 We presented our project of the renovation of the tomb of Wally Neuzil at cemetery in Sinj. We also informed about our planned exhbition on the occasion of Wally´s 100th anniversary of death in a municipial gallery in Sinj. Here is a "screenshot" from our presentation.